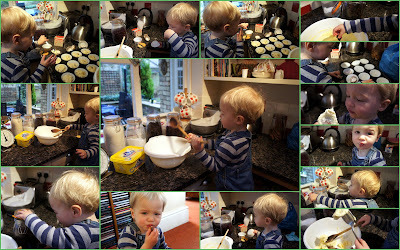 Its a wet Tuesday, too wet to go out, so I decided at 19 months old Rufus was just about old enough for his first baking session. I got everything out before bringing him and his high chair to the kitchen. As you can see he took to it like a duck to water. Though a fair amount of mixture was eaten before it got to the bun papers. and the finished article. Not the best buns ever but he has eaten two so they can't be so bad. I know his Aunty Rachel and Pops will make short work of them when they get home.